The Banff area has some amazingly beautiful mountain peaks. I believe that the Banff, Alberta area is one of the most beautiful areas in all of North America, and I am not the only one. There is so much raw beauty stuffed into this one area of the Canadian Rockies that it is almost impossible to appreciate unless you see the area yourself. From its beautiful and majestic mountains and glaciers to its pristine and crystal clear lakes, the Banff area has it all. If you are into mountains, and I am really into mountains, then the Banff area is the ultimate playground in North America. There is so much for an outdoor enthusiast to see and do that it can be a little overwhelming. Well fret not, we have you covered. In this guide you will find everything you need to know to make your visit to Banff a success. Just make sure you have enough room on your camera for all the amazing pictures you will want to take. The lakes in the Banff area are crystal clear and an amazing blue color because of the minerals in them. The Banff National Park area is actually made up of three national parks that are in close proximity to one another, much like Yellowstone National Park and the Grand Teton National Park in the United States are. In this case, Banff National Park, Jasper National Park, and Yoho National Park make up one of the most beautiful park areas in North America. These parks are in very close proximity to two of Alberta’s largest cities. Calgary, which sits just 109km (about a 1 hour drive) to the West of Banff National Park, is probably your best launching point for a trip to the area. If you want to get to Jasper National Park from Calgary, it is roughly a 305km trip (about a 3.5 hour drive), so the distance is a little further. If you are coming from Edmonton, you are still fairly close to the parks, but it is a bit further of a drive than it is from Calgary. To get to Jasper National Park from Edmonton it is roughly a 313km trip (about a 3.5 hour drive). Banff National Park is a little further from Edmonton, as it is a roughly 396km trip (which is about a 4 hour drive). An overview of the Banff and Jasper National Parks area in Alberta, Canada. A detailed view of the Banff National Park area. The best times to visit the Banff area are undoubtedly during the shoulder months of Spring and Fall. During the summer months (June thru August), temperatures in the Banff area are warmer, but the hotels can be incredibly expensive. During the peak ski season, you can find some pretty good rates on hotels (except around the holidays), but the weather can be incredibly cold. If you are visiting to ski or snow shoe, this may be alright, but if you are coming to sight see, you might want to wait until the Spring or Fall. Although it can snow pretty much year-round in the Banff area, typically you will see the warmest temperatures between June and August. Beginning in late September, the average highs and lows will start to fall. Then beginning in late May the average temperature will start to climb again. Although the summer months in the Banff area are typically the warmest, they are also typically the wettest. The months of May thru August have the highest average rainfall throughout the year, while the months of November thru March have the lowest average rain\snowfall. In case you are interested in visiting the Banff area (and everyone should at least once), here are some other great resources that you can use to help plan your trip. The Banff area is incredibly beautiful, but it is also incredibly expensive. If you are looking for accommodations in the immediate Banff area, it is going to be expensive (especially during the busy summer months). The best way to save money is to plan your travel during the shoulder months of April – May and October – November. You will be able to book hotels that might cost you $300+ in the summer months for a third of the cost. If you have your heart set on visiting during the summer, another way you can save some money is by staying in the Calgary area and commuting, or by staying in Calgary some of the days and then staying around Banff for the remaining part of your trip. You can also try checking on AirBnB to see if someone has a room or house for rent in the area for a reasonable price. I have laid out some of the options you have for hotel accommodations below to assist you. Lake Moraine is one of the most beautiful places in the world. There are so many amazing things to do and see in the Banff area that it is really hard to narrow it down to a short list. This list really could be very, very long. Here are the top things we recommend to see and do in the area. There are many other amazing places that you can explore that are outlined in the resources we listed above. The viewpoint at Lake Moraine is a must-stop for photographers. Moraine Lake might be the prettiest place in Banff National Park. At least, we think it is. And that really says something because Banff National Park and the surrounding area might be the prettiest place in the entire continent of North America. If it’s not, it is in the top 5. Moraine Lake is located in what is called the Valley of the Ten Peaks. It gets this name from the ten mountain peaks that sit behind the mountain. These mountain peaks, with Moraine Lake’s crystal blue waters, make for some absolutely drop-dead gorgeous photo opportunities. To get the best shot of the lake, make sure you climb to the top of the look-out (or you can use the gradual path in the back). A climb to the top is well worth it because it will give you views like you see below. Prepare for your jaw to hit the floor. You can either climb to the top of the viewpoint or take a gradual path in the back to the top. If you are traveling on a budget, you probably won’t want to stay within Banff National Park because all of the lodges are fairly pricey. However, if you do want to splurge for a night the Moraine Lake Lodge is more reasonably priced than the Chateau Lake Louise. It may not be as glamorous as Lake Louise’s Chateau, but the views are equally spectacular. A view of Lake Louise in Banff National Park. When most people think about Banff, they think about the mountains and the crystal blue, glacier-fed lakes. And no lake in Banff National Park is more famous than Lake Louise. Part of the allure of Lake Louise is that it is a drop-dead gorgeous lake that is surrounded by stunning mountains. This is all true. However, part of the allure is also the drop-dead gorgeous chateau that sits on the edge of its waters. A view of the Chateau Lake Louise from the opposite side of the lake. There is a path that goes half-way around the lake and offers some fantastic views of the chateau from across the lake. There is also some amazing hiking trails in the area that are worth exploring if you are into hiking. Just make sure you bring bear spray if you do decide to wander into the wilderness. There are also canoes available to rent at both Lake Louise and Moraine Lake. If you don’t mind a little exercise, is a great way to get a better look at the lake and the surrounding area. However, be aware that these get rented pretty quickly, so make sure you get down to the dock early in the morning if you would like to hit the lake. The Chateau Lake Louise itself is a UNESCO World Heritage Site. The Chateau Lake Louise, which just might be the most beautiful hotel in North America (we think it is), is a grand hotel that sits on Lake Louise inside Banff National Park. In fact, this hotel is so grand that it itself is a UNESCO World Heritage Site. As you can imagine, rates at the hotel are pretty pricey. However, you don’t need to stay at the hotel to drop by to enjoy the beauty of Lake Louise and the chateau. Even if you aren’t planning on spending the night, we would absolutely recommend that you drop by. The town of Banff is a fantastic place to do some shopping and have a nice lunch or dinner. If you need a break from checking out the absolutely stunning landscape in-and-around the Banff National Park area, the city of Banff is a really great place to stop for a bite to eat. There are some really neat shops to look thru and some fantastic restaurant options. If you are having some trouble making up your mind on where to eat, you can check out TripAdvisor’s list of the Top 10 Restaurants in Banff for 2018. You will also find a lot more reasonably priced hotel options in this area. It sits just outside the National Park, so the commute to the parks isn’t that bad. You are going to spend a bit more if you visit during the busy ski season, but if you plan far enough ahead you should be able to find a reasonable rate at a nice hotel. We would recommend starting your search with TripAdvisor. No stop in Banff should be complete without a stop at the Banff Sightseeing Gondola. No trip to the town of Banff is complete without a ride on the Banff Sightseeing Gondola. The Gondola gives you a 360 degree view of the amazing mountain ranges and the beautiful Bow Valley. At the top you can choose to tour the Banff Skywalk, which is a self-guided scenic tour, or just relax with a cup of coffer or lunch and enjoy the amazing views. Either way, we absolutely recommend that you check this out. The Natural Bridge is a fascinating work of nature. The Natural Bridge is something that we kind of stumbled upon by accident in our explorations, but it ended up being one of our favorite sights on the trip. It is a natural rock formation that spans the Kicking Horse River in Yoho National Park. It is amazing to stand on the bridge and watch the flow of water right below your feet. It’s pretty easy to access, so a lengthy hike to get there isn’t necessary. However, you are probably going to want to explore the area a bit. The area is breathtaking. Giant Steps Waterfall is absolutely breathtaking. The Giant Steps Waterfall is another must-see sight if you are visiting the Banff area. It is located just east of Moraine Lake, and requires a short hike in to access. It is well worth the hike because the waterfall is stunning. As you hike in to view the falls, make sure you keep an eye out for wildlife. We saw a ton of deer and a black bear as we hiked in. There is a ton of wildlife all over the Banff area, but we saw the most in this area. A helicopter ride is a fantastic way to see the Banff area. If you are looking for a little adventure for the trip, our top recommendation would be the a helicopter tour. They used to be called Icefield Helicopter Tours when we visited, but they have since changed their name to Rockies Heli Canada. The do an absolutely fantastic job and have very great review on TripAdvisor. It is a little bit out of the way, but it is an adventure you will remember for the rest of your life. The helicopter pilot takes you up-and-over the Canadian Rockies to get an up-close-and-personal look at the beautiful mountain ranges and glaciers in the area. Make sure you bring your camera! Train and history enthusiasts will really enjoy seeing the Spiral Tunnels. If you are interested in learning how they are able to get trains up and over these huge mountain passes, then the Spiral Tunnels are something that you are definitely going to want to explore. These tunnels enable trains to slowly climb the pass by providing a switchback in the tracks that includes tunnels thru the mountains. A map of the Spiral Tunnels at one of the viewpoints. There are two viewpoints from which you can watch an average of 20-30 trains pass thru the tunnels daily, though the trains do not run on a set schedule. So if you want to see a train pass thru, you might have to plan on spending a bit of time at the lookouts (or just get really lucky). An example of the wildlife overpasses in the Banff area. One of the really neat things that we saw when we were in Banff was the abundance of wildlife overpasses. These fantastic pieces of engineering (an example of which you can see pictured above) allow wildlife to cross over roadways so that they aren’t hit by traffic. Wildlife is funneled to these overpasses by fencing along the roadways and sensors, cameras, other other instruments are used on the overpasses to collect important information on which animals are using them. A black bear takes some time to eat berries in Banff National Park. Speaking of wildlife, there is an abundance of wildlife to view in the Banff area. Grizzly bears, black bears, moose, elk, deer, wolves, mountain lions, wolverine, and many other fascinating animals call the Banff area their home. So always have your camera ready because you don’t know when you will see some wildlife. We absolutely loved our time in the Banff area, and it shows in the number of great pictures we were able to take. We have listed some of our favorite below for you to enjoy. This gave me goosebumps because I am literally planning to go to Banff next year! Coincidence? Haha but great post! Will keep this guide in mind when making plans! Awesome!! It is a stunning place! Have a blast! Thank you for the wonderful Canada shout-out! I’m from Toronto and have been to Banff a few times. It’s such a beautiful part of the country. If you ever go back, I highly recommend taking a visit to Canmore and doing some of the local hikes there. Three Sisters Mountains is one of the more popular ones. Awesome!! Thank you for the great tips Matthew! I definitely plan to go back! I completely agree with everything you’ve written. We’ve been to BC 3 or 4 times and it’s incredible every time. I know there are so many unbelievable places to see, but if you missed Peyto Lake, you missed a jewel. Thank you for the fantastic feedback!! 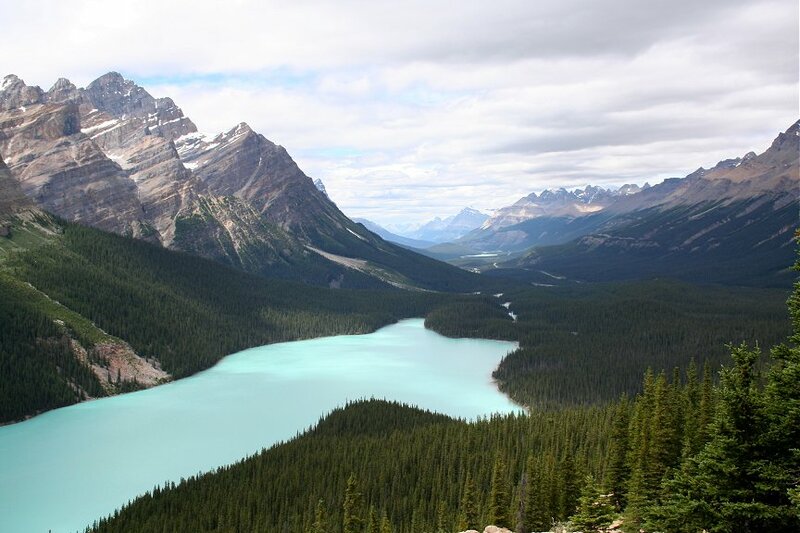 I will have to check out Peyto Lake on my next visit. Thanks for reading! There is nothing that takes my breath away more than Banff. I am in Maui right now and we were discussing how Banff is more awe inspiring. Great guide! Thank you so much for the kind words! Enjoy Maui! Stunning photos and a lot of great info here. Thank you! Thank you for the kind words and thank you for reading Diana! We didn’t have near enough time when we visited some of the Canadian NP’s. This will be a useful guide when we return. Thanks so much Josh! Really great post! Will definitely use on our trip in July!